As VoIP technology becomes more developed, its advantages over traditional communication technology are becoming more and more apparent. Polycom, a well-respected manufacturer of Unified Communications and other VoIP equipment, is leading the way with its line of IP-based voice and video solutions. These unified communications-ready Polycom phones allow you to implement a comprehensive communications and networking solution without needing two completely separate systems. In previous generations of VoIP technology, generally speaking, one would design the data network first, and then implement a compatible VoIP solution that met the demands of the organization. 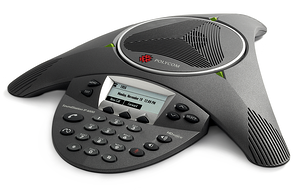 With these new Polycom phones, the VoIP solution is the data network solution. Polycom VVX 1500 Business Media Phone - The go-to choice for desktop voice, video, and application solutions, the VVX 1500 provides you'd expect from a top of the line IP phone. It can handle up to six voice lines, incorporates Polycom HD Voice, and comes with an on board, PoE-ready Gigabit ethernet switch. A large full-color touch screen provides access to the robust telephony features (which can also be accessed using the push buttons) as well as business-class video communications. An open API and webkit-based browser allow organizations to integrate the VVX 1500 into a virtually limitless range of custom applications, with web applications able to act in concert with applications hosted on the phone itself. The VVX 1500 is also available in a dual stack version to take advantage of the next generation of SIP telephony call control. Polycom Video Border Proxy Series - Devices in the Polycom VBR series are designed to work with VVX-based solutions to provide secure, reliable connection across subnets and firewalls without needing a complicated VPN solution. This makes it easy and convenient to include all relevant personnel in any given collaboration or conference without having to sacrifice security of data or communications. Needless to say, this allows for enhanced flexibility in the specific circumstances of internal and external collaboration. 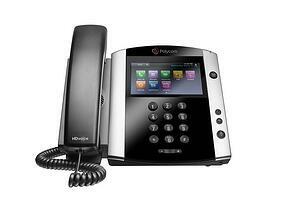 Polycom VVX 500 & 600 Phones - Obviously, not every phone needs to provide the high-level functionality of the VVX 1500. For those places that need voice and a useful suite of on board features (such as being able to view one's Outlook calendar on the phone) these two phones will get the job done. Both are Unified Communications-ready and provide business-grade voice quality. The VVX 600 also provides a range of expansion capability, making it a useful step down from the VVX 1500 while still providing advanced customization. Video capability can be added to these phones using the optional Polycom Camera. Here is the difference between all the different Polycom phones. Polycom Soundstation Conference Phones - Soundstation conference phones are designed to provide the utmost in voice and video quality, so conferences and collaborative meetings can remain focused on the task at hand, rather than having to contend with the distraction of low-quality or inconsistent communications. The Soundstation Duo provides a flexible solution that can bridge the gap between legacy analog communications solutions and modern day VoIP. The Soundstation IP 6000 takes full advantage of the quality of digital audio and provides crystal clear speech, accentuating the particular lows and highs of the human voice. Rounding out the series, the Soundstation IP 7000 is rightly called the most advanced conferencing phone on the market. It provides robust touch screen application capability, and can be used in conjunction with the Polycom HDX video conferencing system for an integrated voice/video conference solution. Polycom phone systems are leading the field in developing comprehensive VoIP/data network solutions that provide the next level in video and customization functionality.